When someone says “chia”, what is the first thing that pops into your mind? For millions, the answer is “Chia pet”, the terracotta figurines where the chia sprouts grow within a couple of weeks to resemble the animal's fur. Who doesn’t remember the Ch-Ch-Ch-Chia commercial? Seriously, name one commercial better than this one. It's enticing. It's smart. It's forward-thinking. It's caring. It's sensitive. It brainwashes you into running out and getting one of those super fun chia pets. It is actually so powerful I’m thinking of getting one right now. In your face Old Spice! For us healthy foodies however, chia seeds are much more than just “pets that grow”. Chia seeds are pretty tasty little suckers, with nutrition credentials that can’t be overlooked. We throw chia seeds in smoothies, make crackers and sprinkle them on every single salad we create. Because when you get your hands on a superfood, you don't want to let go. That’s the number one rule of healthy eating. Right? If you’re still hesitant to jump on the chia seed band wagon, I hope that this super pretty, pink, girly, sweet, creamy, full of unicorns and rainbows pudding, will convince you. Chia really is the seed that just keeps on giving. Check out my post on the the health benefits of this Aztec wonder food and why it’s such a great addition to any diet. 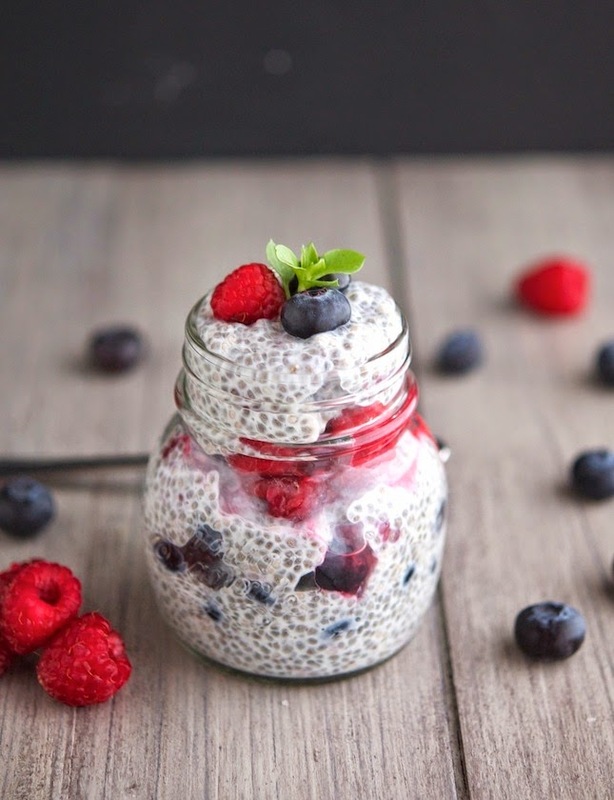 This Vanilla Berry Chia Pudding is a celebration of chia goodness and overall amazingness. It’s super easy to make and requires just a little pre-soaking. Great layered with any fruit you want but berries just fit so well...you have to try it with berries. Vanilla Berry Chia Pudding Print this recipe! After soaking, give a good stir and take a taste. Adjust sweetness if necessary. 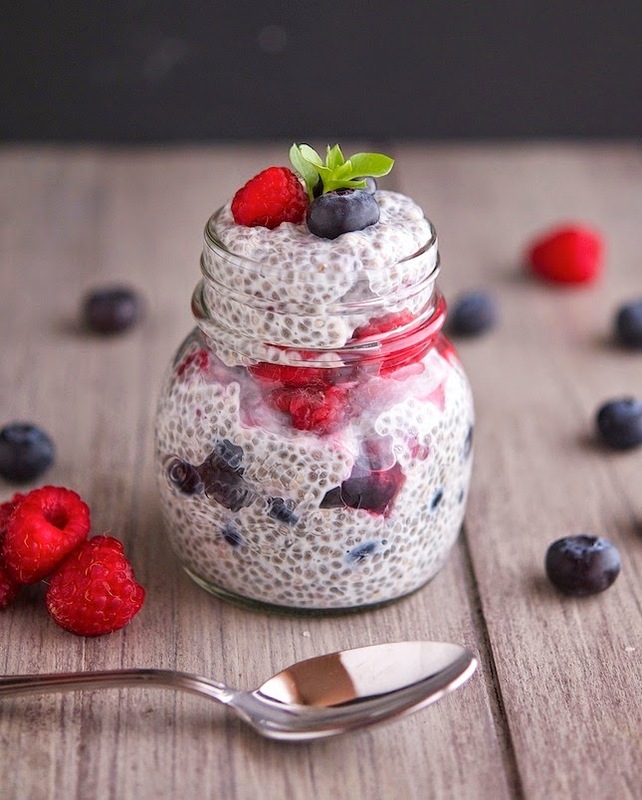 Layer a glass (or a bowl) with the chia pudding and berries. One serving (includes banana) yields 261 calories, 8 grams of fat, 48 grams of carbs and 5 grams of protein. Thanks Tam, you're the best! You should try this Co, it's so good! 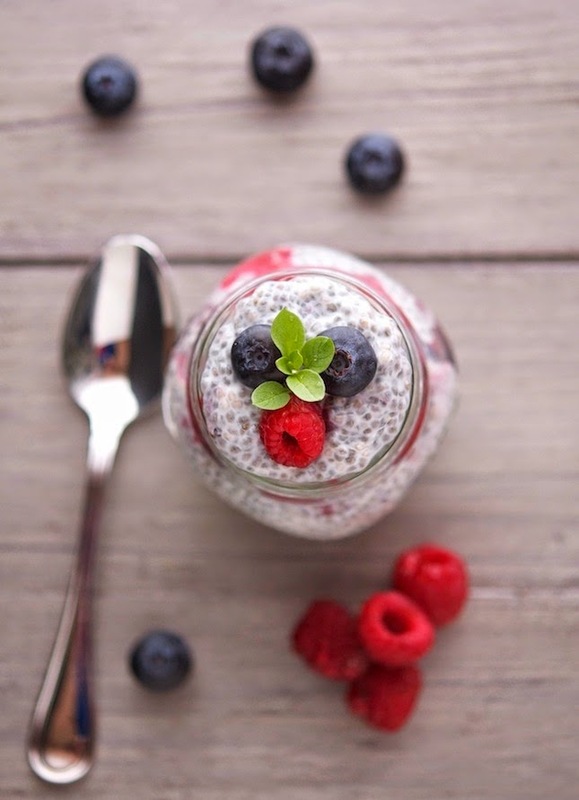 Vanilla chia pudding is my favorite because it goes with everything! I'm totally hooked on grape chia kombucha - which is turning into an expensive habit! Loving your 'girly' pudding! Grape chia kombucha you said? Sounds amazing! Awwww thank you Josefine, that's super sweet of you! Looks really good Mike! gorgeous pic! Haha - you are indeed right about the chia pet song - my daughter till this day sings the chia song EVERY SINGLE TIME I feed her chia chocolate pudding! I haven't tried vanilla chia pudding before - sounds totally delish with the mashed banana thrown in! The chia pet song is a classic and you should totally try chia pudding, it's the thing! This looks so good. I love the little jar!! This looks amazing!! I have wanted to make chia seed pudding for a while! I have to just do it! It looks so healthy and nourishing! Great pictures too!! That's a great looking bowl of chia pudding dude! Loving the vanilla-berry combo.